The National Archives HQ at Kew, formerly known as The Public Records Office, has quite a few records concerning Henham, Essex. Some, such as Wills, are freely accessible on the net at National Archives. where you can obtain much of the relevant information on any entry. Some other records are shown as being stored elsewhere than Kew so check carefully before travelling all the way to south-west London. Other records such as Census Returns and Tithe Awards are covered elsewhere on this site. Below is a listing of many of the probate records concerning Henham Wills and which are held at Kew. I've included the PROB prefix and number (e.g. PROB 11/2121) as this can help you find the record more quickly. Following the Wills are some of the remaining records, including military records, and those that I have found on county archive databases. Will made on 14th April 1590 and witnessed by Thomas ..(?) and John Clark. Proven on 30th Sept 1590. PROB 11/193 1645 AD Will of Samuel Mortlock or Mortlocke, yeoman of Henham. Made on 26th Dec 1644. He mentions his wife Barbara and his house as being bought from Robert Wright. He names his sons as John, Samuel and Edward. He names his daughters as Margaret and Mary and a grand-daughter (?). James Hollam is mentioned. Proven on 25th Feb 1645. Made 10th July ?.and bequeathed her freehold tenement with yards & gardens to her sister Mary, the wife of Richard Chambers. Witnesses were Henry Hollam and Richard Snow. Proven on 14th Oct 1657. Made on 8th Oct 16?5. He mentions his wife, a bequest of 4 acres of land in Henham, John Wright his grandchild, his son William Wright, and a home at Wood End Green. Proven on 8th Oct 1657. Made on 5th March 1656. He mentions his wife Dorothy, his son Thomas Meade, and his brother Henry Meade. Proven in London on 8th June 1658. Made 24th June 16??. She mentions her daughter Sarah and son Nicholas, George Wilson the Minister of Elsenham, and her grandchildren William Wood and Samuel Wood. Proven in London on 28th August 1659. Made on 24th Mar 1720. He mentions his nephew John Michell, niece Sarah Brand, cousin Mary Rolfe the wife of Robert, brother -in-law George Canning, sister Elizabeth Stubbing, and Deborah Michell the daughter of his late nephew Thomas Michell. Proven on 8th Jan 1724. Made on 3rd Feb 1759. He mentions William Bacon (to whom he left Birds Farm plus 4 acres in Howe Common called 'ponpeite' (? ), Joseph Bacon and John Bacon. The witnesses were John Garson, John Archer and Nathan Nottage. He mentions his son William Sams and daughter Mary Wood, the wife of James Wood. Dated 9 Nov 1795 and proven on 6th June 1804. He mentions his grandson Baron or Bacon to whom he left his copyhold messuage or cottage, outhouses, yards and orchards called '˜Gills' in Wood End Green, which was the estate of his late father and now in the tenure of James Brand. To his grand-daughter Ann Baron or Bacon he left his copyheld messuage or tenement called 'Sign of the Star' which was then in his own occupation. He mentions his freehold cottage and tenement thereto adjoining the 'Sign of the Star' which was in the tenure of Thomas Barthrop. He mentions his two brothers John and William. She was the widow of James Church. She mentions her daughter Harriet Elizabeth Church born on 26th March 1803. The Will was proven on 3rd April 1824 where it states that Susannah was formerly of Surrey but late of Barbados. Proven on 21st march 1827. Witnesses were Thomas Nottage, John Mumford and Newman Everitt. He left his estate to his son James Nash and to and Edward \ Edmund (illegible). His property in Henham was then occupied by James Bush and John Neville. PROB 11/1742 1828 AD Will of Thomas Nottage, Auctioneer & Appraiser of Henham Made on 8th Aug 1827. He mentions his sons as George, James and Thomas and his daughters as Sally Cockfield, Mary Philpot, Kitty Nottage, and Emma Nottage. Originally his will gave son George an equal share but a codicil dated 27th Feb 1828 appears to have revoked this bequest. Also mentioned is Enough Bayliss (?) and the witnesses included Anne Probert. Proven on 28th June 1828. 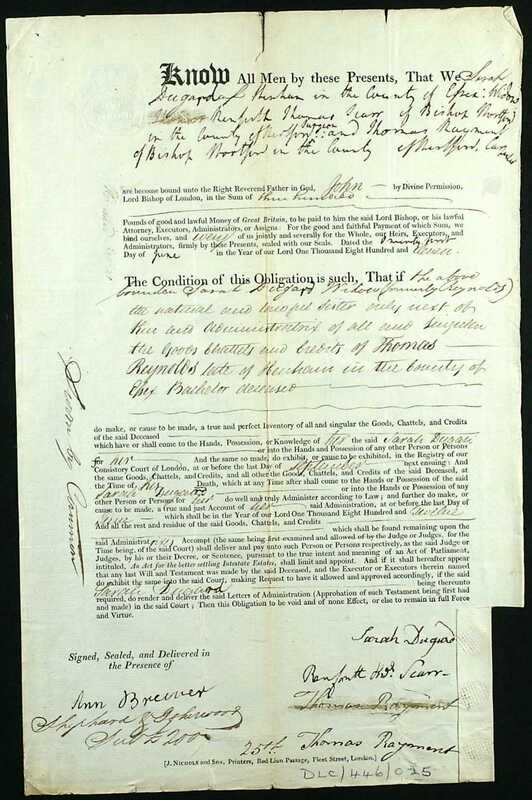 PROB 11/1778 1830 AD Will of Sarah Dugard, widow of William Dugard of Henham. Made Dec 1812. She mentions her god-daughter Ann, the wife of ? Thomas and daughter of Sarah's son John Robert. She also mentions her cousin Mary Judd, widow of the late Mark Judd of Takeley. The witnesses were Robert Colt or Cold ?. There was a codicil dated 27th Jan 1819 when she bequeathed her books and plate to Mrs Sally Stallibrass, wife of William Stallibrass, of Henham Hall, Essex. On 4th Dec 1830 William Stallibrass appealed to change the Will due to Sally's death (possibly on 4th Nov 1830). The witness was George Glyn, Commissioner. The appeal was sworn on 4th Dec 1830 and the Will proven in London on 7th Dec. 1830. Made on 18th Sept 1850. He mentions his brother Thomas Scott as his executor. Proven in London on 19 Oct 1850. States he is of Pledgdon Hall. he names a number of friends to act as his executors. This includes William Canning of Old Mead. He mentions his sons Alfred Lyle Mumford and John James Mumford. He left messuages and two tenements at Pledgdon Green then occupied by Samuel Davy. Proven on 26th Sept 1856. ADM 188/147/116035 - Charles Newman, Official Number: 116035. Place of Birth: Henham, Essex. Date of Birth: 23rd May 1857(NB is on our 1871 census aged 13 yrs) ... Royal Navy Registers of Seamen's Services 1881. C1/189/31 Court of Chancery, Six Clerks Office 1486-1529 John Barley, gentleman v. Richard Walter, gentleman. Detention of deeds relating to lands and tenements called Pynchepolis in Manuden and to lands and tenements called 'Halys' in Henham and Elsnam. John, son and heir of John Wodde v. Johane Wodde, widow of John Wright the executors of John Wodde the father. C1/1483/51-52 Court of Chancery, Six Clerks Office 1556-1558 John Whrytte of Henham v. Alice his mother-in-law. Lands described in Debden, late of William Whytte, deceased, father of complainant. Court of Chancery: Six Clerks Office: Answers etc, before 1660. William Weller of Henham, Essex v. [? ]: bill. C 11/853/53 - Bill only. Plaintiffs: John Peachy, yeoman of Stocking Pelham, Hertfordshire, and Jane Peachy his wife (daughter of James Collin, yeoman deceased of Henham, ...... ...of Chancery: Six Clerks Office: Pleadings 1714 to 1758. Winter Division. DE/2120/44830 Dan Willey the elder of Henham, yeoman and Daniel Willey the younger & middle son to Clement Halls of Henham, yeoman & John Halls of Chickney, yeoman of a messuage called Algoods and lands in Thorley. Dated 7th April 1699. HB/6/1/41/17 A messuage in Hertford - descent of title - George Waylett, yeoman, & Elizabeth his wife, of Harlow and Richard Stanes(?) & Beatrice his wife, of Henham to Thomas Thorogood of Hertford. Dated 9 Oct 1621. Lucie Alphonsine Leontine Marie Braeckman Certificate BZ1335 Note(s): Child of Gerard Jules Marie Braeckman. IR 26/383 Administration in The Consistory Court of London. Administration letter of Thomas Reynolds, batchelor of Henham. The will. He is named as the Intestate and his sister Sarah Dugard also of Henham, and a widow, as his next-of-kin. His estate appears to have be been less than £ 200. Proven in the Court of London dated 25th June 1811. Administration letter referring to James Stallibrass as the testator and 'late of Henham'. His widow and executor is recorded as Elizabeth. The estate was under £1,000. dated 15th Feb 1804. MS 11936/525/1107971 Sun Fire Office Registry 1830-1831 Insured: James Nash of 55, Cow Cross Street, gentleman. Other property: Sandpit Farm, Henham, Essex. WO 69/1/2164 - John Judd Canning. This entry appears on folio 123; this ... ...ROYAL HORSE ARTILLERY: DESCRIPTION BOOKS. Description of soldiers on joining Royal Horse Artillery. This entry appears on folio 123; this number is imprinted at the top right of each folio. Line 5: John JUDD CANNING of Soldiers Unit 2 Battalion. Born Henham, Essex in about 1785. Licence issued on 11th August 1806 at Neston, Cheshire for an intended married between him and Martha Roberts, both being are 21 yrs old (I can't find his birth in the Henham church registers). WO 97/979/40 1839-1843. Henry Clears born about 1821 in Henham. Served in 89 Foot Regiment. Aged 18yrs at his attestation. Discharged 26th April 1839 aged 22 yrs as a Private with a soldier number of 1465. File refers to Royal Chelsea Hospital papers. Below are 8 images of his military career. WO 97/125B/116 1814-1842 Joseph Rickett born in Henham. Served in Royal Artillery. Discharged aged 44 yrs. Also recorded under WO 69/99/121 as Joseph Rickett born Henham, Essex. Enlisted 1814 aged 16yrs. Transferred to 8 battalion 1835.Also shown under WO 69/101/340 for his Statement of Service, Royal Artillery 3 Battalion, soldier number 964 as a driver with The Royal Horse And Foot Artillery Sub Unit Major Whingate's (Rocket) Troop. Also shown in WO 69/3/2441 as serving in Soldiers Unit HB. Our Henham church registers show his baptism as 6th May 1759. WO 97/207/41 - William Shade (should this be Shead?) born in Henham, Essex about 1789. Aged 24yrs at attestation. Served in 1st Foot Guards. Discharged 2nd April 1813 when aged 43yrs from Grenadier Guards. Below are 8 images of his military career. WO 97/310/28 1807-1818. James Ricketts born Henham. Served in 9 Foot Regmt., Royal Marines. Discharged aged 30 yrs. WO 97/440/3 1803-1813. James Shead born in Henham. Served in 24th Foot Regiment. Aged 30 yrs at attestation. Discharged as a Private aged 30 yrs. Below are 2 images of his army career. WO 97/670/31 1822-1825 William Carter born about 1803 in Henham. Served in 54th (or West Norfolk) Foot Regiment. Aged 19yrs. at his army attestation. Discharged as a Private aged 22 yrs. Below are 4 images of his army career. WO 121/83/55 1807. Richard Phillips born in Henham. Served in 1st Foot Guards, 7th Royal Veteran Battalion. Discharged 27th May 1807 from Grenadier Guards as a Private aged 52 yrs after 25 yrs service. WO 398/40/15 Florence Maud Clark. Born in Henham, England on 18th April 1900. Served in Women's (later Queen Mary's) Army Auxiliary Corps. Reference: WO 398/40/15 shows a woman of this name married a Ralph Spencer in Simonstown, South Africa in 1915. ADM 157/1539/21 Folios 21-23 - Alfred William Frost, born: Henham, Bishops Stortford, Essex. Attested at Chatham age 17yrs; Admiralty: Royal Marines: Attestation Forms. Joined in: 1887. Discharge reason: Limited Engagement; Discharge year: 1900. Hew Hicks, esq, and Mary his wife, deforciants. Six messuages, 4 cottages, 4 barns, 3 stables, 1 brewhouse, 7 gardens, 4 orchards, 200a. land, 30a. meadow, 200a. pasture, 4a. wood, and 60a. fuze and heath, with appurtenances in Henham, Elsingham, Bocking, Halstead, Sanden, Much Leighe, and We…ham, Essex. Fine: £500. Octave of Holy Trinity, 3 Geo I. Contents: Waller Bacon of Erlham, Norwich, esquire; to Dame Jane Rawlinson (widow of the late Sir William Rawlinson, knight and serjeant at law) and John Aslaby of Studley, Yorkshire. Estate in Norfolk and Suffolk; all of which were mortgaged by Sir Peter Gleane and Sir Thomas, his son, to the late Samuel Clutterbuck of Ingatestone, Essex, gentleman, from whom Waller Bacon purchased the assignment in 1705; two farmhouses in Grundisburgh and Clopton, Suffolk, a farm in Pledgdon, with lands and hopp grounds and a close called Sandhill, all in Henham parish, Essex. House in Bradford Street, Stansted Mountfitchet, Essex. Deed to declare the uses of a fine, of two houses in Stansted Mountfitchet, from John Bridge of Stansted Mountfitchet, grocer, William Searle of Henham, Essex, weaver, and others, to Richard Clarke of Little Hallingbury, Essex, yeoman, and Peter Cooke of Henham, yeoman, 1724. Conveyance, of two third parts of a house in Stansted Mountfitchet, from Elizabeth Perry of Meesden Herts., widow, and William Searle of Henham, weaver, to Joseph Warwick of Stansted Mountfitchet, maltster, 1753. Conveyance of a house in Bradford Street, Stansted Mountfitchet, from Mary Poole of Great Waltham, Essex, daughter of Joseph Warwick, deceased, to John Say of Stansted Mountfitchet, shopkeeper, 1764. Quitclaim from John and Elizabeth Clements of Little Bardfield, Essex, and from William and Mary Griggs of Great Dunmow, Essex, to John Say, 1764. Mortgage to secure £80, from John Say to Elizabeth Hills of Elsenham, Essex, spinster, 1769. Conveyance from Prudence Say of Stansted Mountfitchet, widow, and Elizabeth Hills, to George Dellow of Ugley, Essex, surveyor, 1779. Conveyance and final concord from James Dellow of Ugley, surveyor, to Nicholas Segar Parry of Little Hadham, Herts., esq., 1806. (1) Anthonie Strelley of Strelley, kt. (2) Richard Kyrbie of Henham, Essex, gent. (1) and (2) covenant that mortgage raised by Sir Nicholas Strelley on Manor of Oxton due to be repaid on 2 June next (see DD/SK/34/16) is to be repaid by (1) on 29 Nov or (1) is to give reasonable assurance that he will repay £500 mortgage, otherwise land is to pass to (2). (1) Sir Anthony Strelley of Strelley, kt. (2) John Byron of Newstead, esq. Manor of Oxton, called Strelleis Manor, with all appurtenances, lands, tenements, meadows, pastures, etc. For use of (2), (1) to pay £390.6.8d. to (2) before 17 Apr and £566.13.4d. to Richard Kirkby by 1 Dec, at times and appointed places. DD/SK/34/38 [no title] 28 May 1560 - held at Nottinghamshire Archives. Contents: Receipt: Richard Kyrby of Henham, Essex, gent. received from Sir Nicholas Strelley, kt. £66.13.4d., being 1 years rent for Manors of Beauchief and Oxton. (Lease DD/SK/34/18). Sig, seal of R.K. Paper, English. DE728/614 Conveyance 25th Jan. 1652/3 - held at Leicestershire, Leicester and Rutland Record Office. Seal (broken) & signature of Lawrence Wright. c) James Bellew of Holborne in the suburbs of the City of London, gent. b) Robert Paynell of Grayes Inne, esq. For £10,000 paid by Lawrence Wright to Jas. Winstanley, the First Parties bargain & sell to Lawrence the Manor of Henham in Essex with all farms, lands, rights, etc appertaining, & also the Advowson & Rectory of Henham, & all other lands, premises etc of the 1st Parties in Henham, & Debden, Pledgden, & Chickney. Seals and signatures of Law. Wright; T. Coke; Robt. Paynell. c) Robert Paynell of Grayes Inne, esq. Whereas Sir Alexander Ratcliffe of Ordshall (Lancs) K.B. & Dame Joane his wife by deed dated 27th Feb. 8 Chas. I, leased to Nicholas Steward, doctor in Civil Law (since dec’d) the Manor of Henham in Co. Essex with all messuages, lands, rents, courts, etc. appertaining to it & all other their lands etc. in Henham and Pledgden To hold at peppercorn rent for 60 years if Sir Alexander & Dame Joan or either of them live so long, and whereas the lease was assigned to Gerard Gore & Henry Grice in Trust for James Winstanley, Now for £10,000 to James from Laurence Wright, Gerard and Henry at the request of James assign to Thomas Coke and Robert Paynell the said Manor to Hold to them for the remainder of the term of 60 years in Trust for Laurence Wright. Contents: Sarah Rous of Bishop’s Stortford, widow: to (Mrs) Frances Sworder of Henham, £50. DE/Z120/44828 Assignment 16 June 1688 - held at Hertfordshire Archives and Local Studies. Contents: By Thomas Gowers of Much Hadham, yeoman, with the consent of Daniel Willey of Henham, Essex, yeoman, to Jane Addams, of Sawbridgeworth, widow, of mortgage on a messuage called Algoods, and lands, in Thorley previously made by Daniel Willey to Thomas Gower. James Winstanley of Grayes Inne, esq. Concerning manor of Henham, co. Essex. James Winstanley of Grays Inn, Rectory impropriate of HENHAM, Co. Essex., Sir Alexander Radcliffe of Ordsall, Co. Lancs., concerned. Contents: Descent of Title:- George Waylett, yeoman and Elizabeth his wife, of Harlow, Essex and Richard Stanes ? and Beatrice his wife of Henham, Essex, to Thomas Thorogood, mercer, of Hertford and his sons George Thorogood, draper, of London and Edward Thorogood. Contents: Insured: James Nash, 55 Cow Cross Street, gent. 2. July 1. 1432 Westminster. To the escheator in Essex. Order to take the fealty of William Robbesson, and to give him and Joan his wife livery of a tenement with one virgate of land in Henham called Stacyesaleyne, and another tenement with 15 acres of land there called Hesdes; as it is found by inquisition, taken before the escheator, that John Chedyoke knight, Maurice Berkeley, Henry Grey, John Dorewarde, Robert Darcy, Oliver Groos, Richard Fox and Adam May were seised of the manor of Henham which is held in chief, and without licence of the king granted to the said William and Joan for their lives the tenements and lands aforesaid, parcel of the said manor, that those grantees entered the same, and that by reason of that trespass the premises are taken into theking’s hand; and for a fine paid in the hanaper the king has pardoned the said trespass, further granting so far as in him lies that the said William and Joan may have again and hold the premises for their lives. HENHAM, a parish, in the union of Bishop-Stortford, partly in the hundred of Clavering, but chiefly in that of Uttlesford, N. division of Essex, 4 miles(N. N. E.) from Stansted-Mountfitchet; containing, with the hamlet of Pledgdon, 855 inhabitants. The parish is separated from that of Ugley by the river Granta or Cam, and is about three miles in length and two in breadth; the lands are generally elevated and richly wooded, and the soil is luxuriantly fertile. The living is a vicarage, valued in the king’s books at £17; patrons and impropriators, J. S. Feake, Esq., and others. The great tithes have been commuted for £510, and the vicarial for £331. 16.; the glebe comprises 2 acres, and attached to the living is a farm of 70 acres. The church is in the early English style, with a massive tower surmounted by a lofty spire, and has a nave, separated from the north and south aisles by clustered columns supporting finely pointed arches; and a chancel, divided from the nave by an ancient screen, and containing some old monuments. There is a place of worship for Independents. In the Taxation of 1291 the temporalities of the priory were valued at £40 19s. 2½d. yearly,the principal amounts being £11 2s. 8d. in Little Dunmow, £5 9s. 3½d. in Burnham, £4 5s. 9½d.in Rayne and £3 11s. 8d. in four parishes in London. Property was also owned in Henham. The church of Henham in Essex was also appropriated. Walter lord fitz Wauter and of Wodeham, lord of Haydepuys and Rochetisson in Normandy, to Richard Pynchebeke, Richard Welby, Henry Staumpe and Edward Hager. Letter of attorney, appointing them to give Lewis Johan, Richard Baynarde, John Tyrell, Robert Darsy, Richard Fox, William Neulonde, Robert Molynton, William Fawkeswell and Richard Durivalle clerk, their heirs and assigns, seisin of the manors of Wodham Wauter, Ultyng, Burnham, Cage, Crixhuthe, Lexden, Great Teye, Little Dunmowe and Henham co. Essex, and his purparty of the manors of Multon, Flete, Beausolas in Algarkyrke and Skyrbeke with the rents and services of his tenants in Kyrton co. Lincoln, and all his lands, rents and services, reversions, woods, commons, wards, marriages, heriots, reliefs, knights’ fees, fisheries, warrens, parks, mills, suits of court, franchises, neifs and all that goes with them, advowsons etc. in Wodeham Wauter, Ultynge, Burnham, Cage, Crixhitthe, Lexden, Great Teye, Little Dunmowe, Henham, Multon, Flete, Beausolas, Skyrbeke and Kyrton. Dated 12 July 3 Henry VI. Sir Walter Fitz-Robert, (fn. 16) son of Robert de Tonnebrigge, the fifth son of Richard Fitz-Gilbert, sirnamed de Tonebrigge, the first Earl of Clare, who came in with the Conqueror, of whose gift he had the castle and town of Clare in Suffolk, with Tunbridge in Kent, and divers other great lordships in England. This Earl was son of Gilbert, sirnamed Crispin, Earl of Brion in Normandy, and son of Jeffery, natural son to Richard I. of that name, Duke of Normandy: he bare, as the Fitz-Walters ever after did, the Earl of Clare’s shield varied, which is or, three chevrons gul. The Fitz-Walters being or, a fess between two chevrons gul. He had two wives, Maud de Bocham, (as Mr. Weaver,) or rather Margaret de Bohun, (as Mr.Dugdale,) and Maud, daughter of Sir Richard de Lucy, as aforesaid, in whose right he had this manor, to which he first obtained a charter for a fair, on the eve, day, and morrow after the feast of St. Simon and Jude, and three days following. He was Justice itinerant in Norfolk and Suffolk, and died in 1198, being buried in the midst of the quire of the priory church of Little Dunmow in Essex, of which Robert de Tonebrigge, his father, was first founder; he was sometimes called Walter of Clare, sometimes Robert Fitz-Walter, but mostly Walter Fitz-Robert; he left Robert the Valiant his heir. Sir Robert Fitz-Walter, Knt. (fn. 17) son of Sir Walter Fitz-Robert, commonly called Robert the Valiant, had two wives, Gunnora, daughter and heiress of Philip de Valoines, and Rohesia or Rose, who survived him, and had the manor of Diss, Hemenhale, (which always went with Diss,) Theye, and Diss hundred in dower. He it was that first divided this manor, by giving a moiety of the two parts which he possessed to Sir Gilbert Pecche, Knt. with his daughter Alice (some say sister) in free marriage, with the third part of the hundred and market, and so there branched a third manor, which was called Pecche’s Fee. This Robert was leader of those barons that rose against King John, the beginning of which was on this occasion, as the book of Dunmow informs us. “About the year 1213, (fn. 18) there arose a great discord between King John and his Barons, because of Matilda, sirnamed the Fair, daughter of Robert Fitz-Walter, whom the King unlawfully loved, but could not obtain her nor her father’s consent thereunto; Whereupon (and for divers other like causes) ensued war throughout the whole realm; the King banished the said Fitz-Walter, among others, and caused his castle called Baynard, and other his houses, to be spoiled, which being done, he sent a messenger unto Matilda the Fair, about his old suit in love, and because she would not agree to his wicked motion, the messenger poisoned a boiled or potched egg, against she was hungry, and gave it unto her, whereof she died in 1213.” Her tomb was standing between two pillars in the priory church of Little Dunmow, when Mr. Weaver published his book. In the catalogue of emperors, kings, princes, and other potent persons, that have entered into this religious order, this Robert (fn. 37) was one. It seems as if the church of Diss was built by this man, his arms cut in stone still remaining several times on the south porch. John, (fn. 42) his son, then 13 years old, possessed of two parts of his estate, the third being held by the said Joan in dower; he was a ward of Henry de Percy’s; but in the ninth of Edward III. by the King’s special favour, his homage was accepted, and livery made to him; Diss manor then was valued at 31l. Hemenhale at 48l. Fincham at6l. 13s. 4d. He was in the French wars in 1359, being one of those appointed to accompany Sir Walter Manny in that skirmish at the barriers of Paris, the Duke of Normandy then lying in that city, and was then knighted. He married Eleanor daughter of Henry Lord Percy, his guardian, was summoned to parliament from the15th to the 34th of Edward III. exclusive, and died upon Monday the feast of St. Luke the Evangelist, anno 1360, leaving Walter, his son and heir, 16 years of age, Joan his mother surviving him; she died in 1362, whereupon Walter her grandson was found to be next heir, and 19 years of age, this manor (fn. 43) being then held at three fees as of the Barony of Baynard Castle. Sir Walter Fitz-Walter, second son, and now heir, of Walter Lord Fitz-Walter, brother and heir of Sir Robert Fitz-Walter, first husband of the said Philippa, had livery of the manors of Diss and Hemenhale, with their appurtenances, all which (except the advowsons) were held in dower by the said Philippa; but they went with the rest of the estate of the said Robert, and had been in possession of the said Walter ever since 1389, when he had livery to them, as heir to Walter his father, and Robert his elder brother; and accordingly I find, he presented to Diss, in 1390 and in 1399; Philippa aforesaid levied a fine, to Alexander Walden, Sir Richard Bouchier, Knight, and others, settling these manors on herself for life, after to the said Walter and his heirs, as his inheritance. This Walter married Joan (fn. 50) daughter of Sir John Devereux, Knight; he died in 1408, and ordered his body to be buried in Henham church, leaving Joan his wife, who soon after married to Hugh Burnel, and two sons, Humphry and Walter, and one daughter named Eleanor. John Ratcliff, Knt. brother of the said Thomas, who was soon after summoned to parliament as Lord Fitz-Walter, and in right of his wife enjoyed all the honours and possessions of this noble family; and though we have different accounts of this matter, the escheat roll confirms it to me (fn. 57) that this Elizabeth was the wife of John, and not of Thomas Ratcliff, as is said by some. Robert Ratcliff, son of the said John, who was in so great favour with that king, that he not only restored him in blood and estate, but made him knight of the garter, Lord Fitz-Walter, Egremond, and Burnel, and afterwards, (fn. 61) on the 16th of June, 1523, created him Viscount Fitz-Walter, and on the 8th of December, 1529, Earl of Sussex: he had three wives; by Elizabeth daughter of Henry Stafford Duke of Buckingham, he had Henry Lord Fitz-Walter, who succeeded him; he died at Chelsey the 28th of November, 1542, and is buried in the church of Boreham, in London diocese, with two other earls, his son and grandson, under a sumptuous monument, as appears by their inscriptions in Mr. Weaver’s Funeral Monuments, fol. 635. Walter lord Fitz Wauter and of Wodeham, lord of Haydepuys and Rochetisson in Normandy, to Lewis Johan, Richard Baynarde, John Tyrell, Robert Darsy, Richard Fox, William Neulonde, Robert Molynton, William Faukeswelle and Richard Duryvalle clerk, their heirs and assigns. Charter with warranty of the manors of Wodeham Wauter, Ultyng, Burnham, Cage, Crixhicche, Lexden, Great Teye, Little Dunmowe and Henham co. Essex, his purparty of the manors of Multon, Flete, Beausolas in Algerkyrke and Skyrbeke with the rents and services of his tenants in Kyrton co. Lincoln, and all his lands, rents and services, reversions, woods, commons, ways, hays, wards, marriages, heriots, reliefs, escheats, knights’ fees, fisheries, warrens, parks, mills, suits of court, franchises, neifs and all that goes with them, advowsons of churches, abbeys, priories, almshouses and chapels, and other rights etc. in the towns abovementioned. Witnesses: (fn. 1) lord Ferrers, (fn. 1) lord Gray of Wylton, Lewis Robesarde lord Boucer, William Coggeshale, Maurice Bruyn knights of Essex, Ralph lord Cromwelle, Robert Roos, Robert Hakbeche knights, Richard Pynchebeke, Richard Welby esquires of Lincolnshire. Dated Wodeham Wauter, 12 July 3 Henry VI. From: ‘Close Rolls, Henry VI: 1425′, Calendar of Close Rolls, Henry VI: volume 1: 1422-1429 (1933), pp. 260-261. Samuel Southen and Thomas Davies alias Johnson, yeoman, of Henham, Essex. Appeared and took oath to answer articles, and was admonished to be examined before next court day. Samuel Butcher [Southen ? ], clerk, and Thomas Davy alias Johnson, of Henham, Essex. Counsel for the office had till next court day to signify whether they would insist on defendants’ answers. Samuel Southton [Southen], clerk, late of Henham, Essex. Time assigned for the promoter to prove his case. Samuel Southen, clerk, of Henham, Essex. To hear decision concerning the sufficiency of his answers. From: ‘Acts of the Court of High Comission’, Calendar of State Papers Domestic: Charles I, 1635-6 (1866), pp. 81-133. From: ‘General Index: D, E’, Calendar of State Papers Domestic: Charles I, 1635-6 (1866), pp. 596-602. Page 457 - Charter of Walter fitz Wauter the elder knight, son of Sir Robert fitz Wauter lord of Wodham, giving with warranty to Walter fitzWauter lord of Wodham, his heirs and assigns, all the grantor’s purparty of the manor of Flete, and all lands, rents and services which he has or ever had in the town of Flete or elsewhere in Lincolnshire. Dated Henham, 1 October 50 Edward III From: ‘Close Rolls, Edward III: November 1376′, Calendar of Close Rolls, Edward III: volume 14: 1374-1377 (1913), pp. 450-465. PLEDGDON, a hamlet, in the parish of Henham, union of Bishop-Stortford, hundred of Clavering,N. division of Essex, 3½ miles (N. E. by E.) from Stansted-Mountfitchet; containing 162 inhabitants. From: ‘Pleaseley - Plumpton, Wood’, A Topographical Dictionary of England (1848), pp. 576-578. The priory was leased (fn. 15) in 1537 to Henry Parker; and in January, 1539, it was granted for £100 to him and Mary his wife in tail male, with the rectory of Berden and various possessions in Berden, Manuden, Elsenham, Henham, Takeley, Rickling, Clavering, Ugley, Rochford, Brent Pelham and Stokyng Pelham, of the total yearly value of £23 7s. 0d., at a rent of £2 7s. 0d. From: ‘Houses of Austin canons: Priory of Berden’, A History of the County of Essex: Volume 2 (1907), pp. 143-144. Aug. 18. Westminster 1378 John Tebaud to Peter Tebaud his brother. Quitclaim of the manor of Plegeden co. Essex, which the said John and Peter had by charter of John Malwayn. Witnesses: John Baryngton, Robert House, William Botiller of Hanham. Dated Plegeden, the eve of All Hallows1 Richard II From: ‘Close Rolls, Richard II: August 1378′, Calendar of Close Rolls, Richard II: volume 1: 1377-1381 (1914), pp. 206-212. 28–30. Probates of the wills of William Lambe of Buttisbury,1474; Alan Lambe of Finchley, 1549; and of James Lambe, clerk, Vicar of Henham, Essex, 1563. From: ‘Queen Elizabeth - Volume 27: January 1563′, Calendar of State Papers Domestic: Edward, Mary and Elizabeth, 1547-80 (1856), pp. 215-218. Most of the parish business naturally concerned poor relief. When the parish accounts begin it appears that the policy was one of out relief only. In 1715 there was a payment of £3 for badges for paupers. There were similar payments for badges in 1729 and in 1746 it was ordered that badges should be worn by all those receiving weekly doles. In 1728 there were 19 people receiving doles; in 1732 16 people, and in 1733 13 people, were receiving doles totalling respectively£1 13s. 7d. and £1 6s. 4d. a week. There were also frequent payments for the provision of clothing, for nursing at home, and for rents. Occasionally, at least, paupers’ children were bound out as apprentices. In June 1785 it was decided to advertise in the Chelmsford papers in order to get 3 or 4 boys placed as apprentices; in the following month one was apprenticed to a baker at Henham. From: ‘Theydon Garnon: Parish government and poor relief’, A History of the County of Essex: Volume 4: Ongar Hundred (1956), pp. 271-273. To Simon de Bereford, escheator beyond Trent. Order to deliver to Joan, late the wife of Robert le fitz Wautier, tenant in chief, the following of the said Robert’s lands, which the king has assigned to her as her dower by the assent of Henry de Percy, to whom the king committed the custody of two parts of the lands of the said Robert during the minority of Robert’s heir: the manor of Henham, co. Essex, of the yearly value of 27l. 12s. 8d. ; the manor of Hemenhale, co. Norfolk, of the yearly value of 48l. 1s. 10¾d. ; and the manor of Shymplinge, co. Suffolk, of the yearly value of33l. 7s. 0¾d From: ‘Close Rolls, Edward III: August 1328′, Calendar of Close Rolls, Edward III: volume 1: 1327-1330 (1896), pp. 305-319. Feb. 28. 1389 Westminster To the treasurer and the barons of the exchequer. Writ of supersedeas in respect of their demand against Thomas duke of Gloucestre to answer for a yearly farm of 180l. 11s. 4d. for the manors of Burneham, Wodeham Wauter, Little Donemowe, Henham and Reyndoun co. Essex late of Walter Fitz Wauter of Wodeham knight, although on 15 July 11 Richard II the king committed to him the wardship of the same at that rent, being in the king’s hand by the said Walter’s death and by reason of the nonage of his heir, from Midsummer then last until the lawful age of the heir, and order to discharge the said duke and other the farmers and tenants thereof; as John bishop of Hereford the treasurer, recollecting a bargain made between him and the duke, has borne witness before the king that the duke should have to farm for 158l. 13s. 8d. (sic) a year the manors aforesaid with a hamlet called Ultynge and a moiety of the lordship of Maldoun, which by inadvertence are omitted in the king’s letters patent; and the duke having given up those letters patent in chancery to be cancelled, by other letters patent of the aforesaid date the king committed to him the wardship of the said manors, hamlet and moiety from Midsummer aforesaid at the rent above mentioned, maintaining the houses and buildings to the same pertaining and bearing all charges,40l. a year being allowed of his farm for maintenance of the heir. Proviso that answer be made by the duke for the farm of 158l. 13s. 4d. (sic) a year. From: ‘Close Rolls, Richard II: March 1389′, Calendar of Close Rolls, Richard II: volume 3: 1385-1389 (1921), pp. 661-665. Appeared and took oath to answer articles. Hanchett is examined, and all ordered to answer the articles before any prosecutor is named. From: ‘Acts of the Court of High Commission’, Calendar of State Papers Domestic: Charles I, 1634-5 (1864), pp. 314-337. 20. Petition of Lawrence Wright, M.D., patron of Henham vicarage, Essex, to the Protector. The vicarage is only worth 50l., the parish large, and long destitute of a preaching minister; has lately obtained one approved by the Committee for Public Preachers, but is in danger of losing him for want of maintenance. Begs 50l. a year from the trustees for ministers, as the augmentations of 30l. to Mr. Latham of Stifford and 34l. to Mr. Ball of Fornes Pelhams, co. Herts, cease, by both being settled in other livings. From: ‘Volume 72: June 1654′, Calendar of State Papers Domestic: Interregnum, 1654 (1880), pp. 194-232. 24. Acts of the Court of High Commission January 1635-6—May 1636 Jan 28th - Peter Banson, of Henham, Essex - Appeared and took oath; to be examined before next court day. Feb 4th - Peter Banson, of Henham, Essex - Three days allowed to consider of his answers, and if the prosecutor do not insist thereupon, then the second session of next term assigned to make proof and return commission. Walter lord fitz Wauter and lord of Wodeham to Alexander Walden,William Bourchier knights, Robert Newport, Richard Baynard of Messynge, John Basset of Chishulle, Alexander de la Garderobe and Simon Cisterne clerk, their heirs and assigns. Gift with warranty of the reversions of the manors of Hemenhale and Disse co. Norfolk with the knights’ fees, wards, marriages etc., rents, services of freeholders and neifs, now held for life by Philippa lady fitz Wauter of the said Walter’s heritage, and of the manor of Shymplynge ate Thorne co. Suffolk, the manors and advowsons of Wymbissh and Sherynge co. Essex, and the advowson of Hemyngby church co. Lincoln, with the knights’ fees etc., now held in dower by the said Philippa with reversion to the said Walter and to his heirs. Witnesses: Aubrey de Veer earl of Oxford, John de Bourchier, William Coggeshale, Ralph Shelton knights, Robert Teye, William Rokewode. Dated at his manor of Henham, 29 January 21 Richard II. Writing of Sir Walter fitz Wautier lord of Wodeham, granting to Alexander de la Garderobe the office of warrener everywhere in the said Walter’s lordship in the town of Burnham co. Essex, and the fee thereof, taking for his wages one quarter of wheat every eight weeks during his life in the manor of Burnham by the hands of the said Walter’s bailiff there, pasture and keeping (custodiam) for forty ewes with the lord’s ewes at le Redewerde, pasture and keeping for 40ewes with the lord’s ewes at Douniswyk, keeping and pasture for three kine with the lord’s kine, and hay and pasture for one horse of the hay and pasture of the said manor, with power to distrain therein if his wages be fifteen days in arrear, or if he be hindered of the pasture, hay or keeping aforesaid. Dated Henham co. Essex, 1 August41 Edward III. From: ‘House of Lords Journal Volume 63: 20 April 1831′, Journal of the House of Lords: volume 63: 1830-1831, pp. 474-496. Joseph Offley of the Middle Temple, esquire, by his will dated 30th June, 1719, and proved 8th March, 1721–2, left his lands in Icklesham and Gestling, Sussex, Kentish Town in St. Pancras, Carrington and Wiltshead, Beds., Clavering, Henham, Cowfield, High Easter and Dunmow, Essex, in trust for his cousin Stephen Offley of Norton, Derby, eldest son of Robert Offley of Norwich, merchant, remainder in tail to his sons. From: ‘St. Pancras Old Church’, Survey of London: volume 19: The parish of St Pancras part 2: Old St Pancras and Kentish Town (1938), pp. 72-95. From: ‘Henry VIII: December 1513, Letters and Papers, Foreign and Domestic, Henry VIII, Volume 1: 1509-1514 (1920), pp. 1102-1121. From: ‘Alumni Oxonienses, 1500-1714: Barrowby-Benn’, Alumni Oxonienses 1500-1714: Abannan-Kyte (1891), pp. 79-105. Sir Thos. Audeley, Chancellor. Licence to alienate the site, ground, circuit, &c. of the late monastery of Walden, Essex, with the manors of Brokewalden, Pounces, Matenys, Seynt Alottys, Abbotys in Thunderley, Mynchon in Arkesden, Chyssyll, Ellesnam and Terlyng, advowsons of the vicarages of Walden, Arkesdon, Magna Chyssyll, Ellesnam and Terlyng, Essex; and all other lands in Walden, Brokewalden, Lyttebury, Newporte, Pounces, Matenys, Seynt Alottys, Thunderley, Arkesden, Beerden, Assheden, Wenden Magna, Wenden Parva, Henham, Depden Elmedon, Terlyng, Leigbes, Hatfeld Peverell, Boreham, Whitteham, Blakenotley, Falborne and Fairsted, Essex, Lynton and Reche, Camb., and Sturmer, Suff. ; and the manors of Corney Bury, Braughynge, and Mylkeley, Herts; rectories and advowsons of Braughyng, Leyston, and Alswike; and all other lands in Braughyng, Mylkeley, Corney Bury, Leyston, Buntyngford, Wydyale, Westmyll, Ware, Stondon, Nuttehamsted, Barkewaye, Thorley and elsewhere, Herts; with reservations; to John Eyre and James Vawdye, to be regranted within a month to Sir Thomas and dame Eliz. his wife, and the heirs of the said Sir Thos. for ever. Berechurch, 8 Sept. Pat. 30 Hen. VIII., p. 5, m. 28. From: ‘Henry VIII: September 1538 26-30′, Letters and Papers, Foreign and Domestic, Henry VIII, Volume 13 Part 2: August-December 1538 (1893), pp. 164-194.